Thank you for taking a Thunders Loyalty Card. Our card is designed to reward you for your loyalty to our bakery. We have more information about how it works in our frequently asked questions below just click the question to reveal the answer. You can collect points @ 10c per 1€ spent on selected menu items. Which menu items can I collect points on? You can collect points on Thunders Deli menu including hot and cold beverages. Bread and cakes are not included in the loyalty scheme. Points can be redeemed against Thunders Deli Menu items including hot and cold beverages. The full value of the item must be available on the loyalty card before it can be redeemed e.g. for a menu item of €3.25 you must have 325 points collected. Points can be redeemed at any Thunders Bakery Location. See our full list of locations for your convenience. 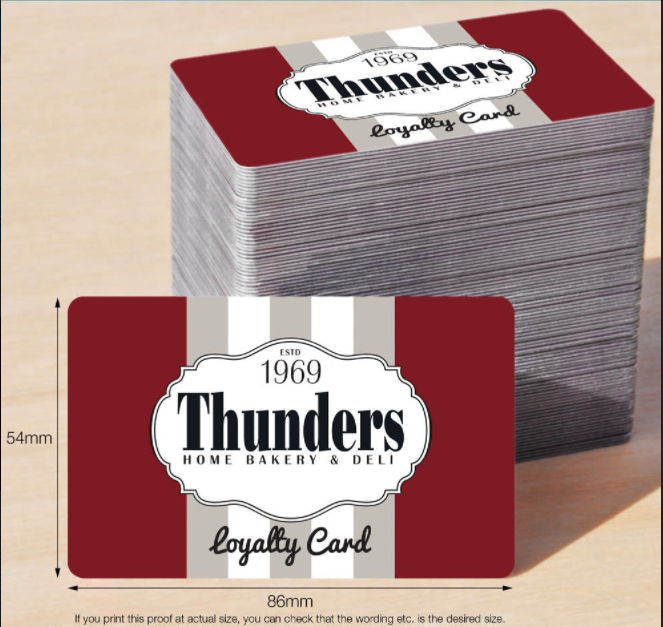 Loyalty cards are available in every Thunders Bakery Location. Just ask any of our team and they will be happy to help. Can I register my loyalty card? Unfortunately, our loyalty card is not linked to any database. What happens if I lose my loyalty card? Unfortunately, we cannot reimburse any points value from lost loyalty cards. Your lost loyalty card can be replaced with a new one. Does my Loyalty card expire? Thunders loyalty cards do not expire however after a period of 12 months of inactivity they will be deemed lost and will become invalid. We are sorry if we have not answered your loyalty card query. Please Click here to send us your question and we will get back to you without delay.